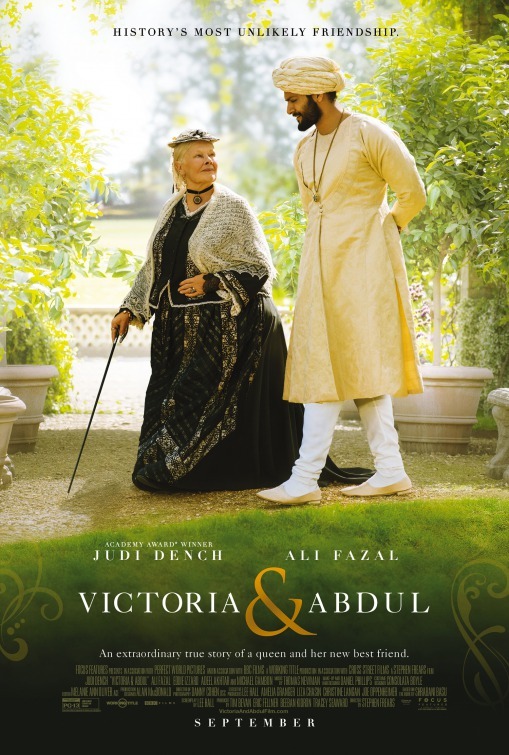 A delightful tale of a blossoming relationship for a rather odd couple is the foundation of the film Victoria & Abdul, based “on real events… mostly” – the rich story of how love between an unlikely pair enriches each life and serves to break down barriers meant to divide them. This is a tale about a little unknown slice of history that will be remembered by many. Abdul Karim (Ali Fazal), a handsome young Indian clerk tolling away with record keeping in a north Indian prison, is informed that he has been selected to attend the golden jubilee of Queen Victoria (Judi Dench). His key role is to present her with a gift as part of the celebrations. The tall young man, chosen solely for his height and good looks, is given strict instructions not to look at the queen during the presentation. Abdul’s curiosity gets the best of him and he can’t resist but look at the rather grumpy monarch. Their eyes lock and the twinkling-eyed smiling servant changes the Empress of India’s frown into a smile. This one encounter sets of a chain of events, leading to touching and deep friendship. Abdul engages in long conversations with the queen explaining to her the wonders of India. She is so delighted with her new companion that she commands him to no longer be her servant but her Munshi (the Urdu word for teacher). Abdul becomes his queen’s constant companion. As the mutual affection grows between the unlikely pair, many in the queen’s court are horrified at the idea of her royal highness associating with someone not only of a different race but also of a different color and not a member of nobility. Those entrusted to advise the owner of the English crown do their best to discredit Abdul. The clever queen does not succumb to those trying to manipulate her and only continues to elevate Abdul’s status in the court which infuriates the lords and ladies of the royal household further. Ali Fazal is delightful as the wide-eyed traveler adjusting to the wonders of a foreign land. The Bollywood actor is nicely cast in his breakout Hollywood role. Judi Dench, true to form, is a powerhouse playing Queen Victoria for the second time (she first did the role in the film Mrs. Brown). The screen legend is amazing depicting the regal tight-lipped queen of England. She pretty much steals the show and is so strong in her role that the scales are bit uneven with Ali Fazal playing her co-star. Although he does a pretty good job playing the cheerful optimistic visitor, Fazal can’t really hold a candle to Dench. So at times the movie feels just a bit out of sorts since Fazal and even the supporting cast can’t quite measure up to the Oscar winner’s performance. Victoria & Abdul touches on racial and social divides but at times it seems almost too easy and unrealistic that a man from a country suffering the cruelty of British colonization would just adapt so easily to life at the castle. The film hints that Abdul may not be all at that he appears to be. One scene in particular shows Abdul exiting a carriage after returning from India looking like a Maharaja. The amazing royal outfit he was wearing hinted that he was much more than just a clerk, but we never find out more about him. We don’t really know how a clerk has so much knowledge and education that he is able to share with his new friend. It is revealed that Victoria is lonely and depressed, but then the topic is dropped almost as quickly as it comes up. The ultimate treatment of Abdul and his family is pretty deplorable but not completely explored. Despite the rather light tone of the movie there were moments that could have been captured and explored further to add more depth to the proceedings. There will be many smiles after seeing an aging woman find joy in the later years of her life by receiving love from an unexpected source. Despite a few weaknesses this story still manages to delight. Victoria & Abdul is filled with beautiful scenery. Shots of the English and Scottish country side, along with a trip to Florence, the fantastic interior of Windsor Castle, and the stunning costumes are all beautiful touches adding to the whimsical mood of this production. The lighting and music also effectively contribute to the dreamy feel of the film. There are several funny moments that make watching this production a joy. Guests frantically trying to keep up with the queen at dinner, dialogue between Abdul and his disgruntled friend Mohamad (Adeel Akhtar), and royal staff trying to stay one step ahead of their queen are certain to have audiences rolling with laughter. For the most part this endearing film about two people from such opposite poles of life bonding through love and friendship is pleasure to watch and any weakness in the product will be easy to overlook.